Barcelona is a vibrant and dynamic city, packed with fascinating venues and must-see beaches. This Catalonian capital is not only ideal for tourists, but it’s also a great destination for business trips. From big executive, to individuals or smaller businesses trying to gain information and inspiration, Barcelona can cater to all. It doesn’t have to be a difficulty when finding a place to stay during your trip, there’s a range, from hotels to villas and more. How about staying in an apartment? Whether with family or a business partner you could all stay in apartments near the beach of Barcelona during your time and enjoy the views from your windows. Here’s a few reasons why Barcelona will make a great place for a holiday as well as a business trip. Barcelona is situated between the sea and the mountains and offers the best of both worlds when it comes to recreation. The beautiful beaches dotted along the coasts of La Costa Brava leave an indelible impression on many visitors. The best way to make the most of any holiday is to delight in the golden beaches and blue seas that the country has to offer. Combine work with leisure, for those on business, make it a necessity to find some respite time by luxuriating on these seaside splendors. 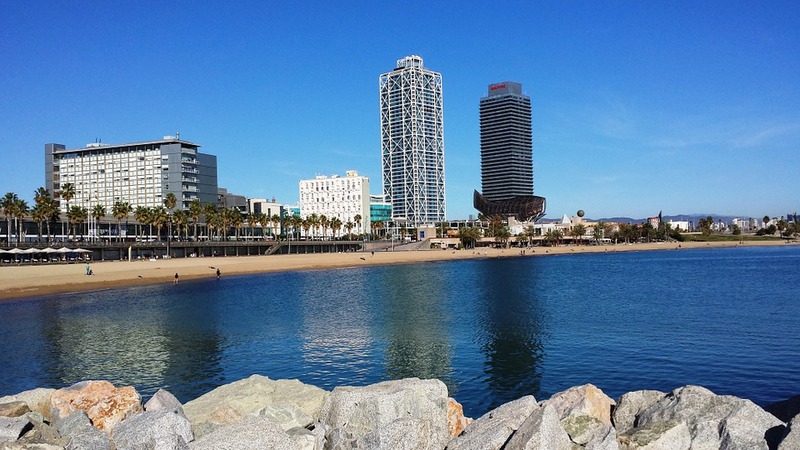 Barceloneta is one of the beaches situated closest to the city centre, so it makes for an easy escape after a meeting. Come away from the heat of city life and let the warmth of the sun relax your mind instead. There’s a variety of restaurants across this beach also, perfect opportunity to indulge in some good food. Only a few miles from arriving at the new modern airport, the central business district of Barcelona appears. Eixample is a great spot for viewing a host of businesses, shops and places to go out. This is an upscale residential area, so for all you tourists it offers many things to do. Be the spectator of some grand architecture from the likes of Gaudi and Beaux Arts. Innovative or Intriguing, these are both words used to describe the glories of the constructs dotted around this city. Gracia is also a very popular place for business and adventure, it holds a special atmosphere day and night with quirky independent shops and a classic cathedral. There are many successful congresses that take place in Barcelona’s capitals. Mobile world congress, is the world’s largest gathering for the mobile industry and will offer much inspiration for any business man or women involved in this trade. Dali Theatre-Museum is a great example of a place to visit, not only for the family to enjoy and consider the thought-provoking pieces from Dali, but for those artistic minds travelling to gain inspiration and ideas for an exhibit of their own. Prepare to be transported to a parallel universe as you behold superb sculptures and thought-provoking displays. For those aspiring master chefs out there, intrigued by the culinary climate of Spain, Barcelona offers much variety and enlightenment. Maybe you own a restaurant and desire new ideas, or you just want something delightful to eat, it’s all accomplishable in Barcelona.